Check out our CIES presence handout for information about the Equity Initiative panels, workshop, and reception at CIES 2019! Presentation slides from What’s Next for Equity in Education? hosted by the Equity Initiative at Save the Children on November 6, 2018. Participants heard from leading Equity Initiative members on their efforts to generate data and evidence on equity at both a systems level and at a programmatic level for teaching and learning. What's Next for Equity in Education? Learn about new research products and priorities from the Equity Initiative and its workstreams for 2018-2019! While equal access to quality education is the fundamental principle driving the education development agenda in the post-2015 world, information on inequality and its effects is limited. This fact sheet outlines the Education Equity Research Initiative, which connects organizations and individuals interested in developing, supporting or disseminating evidence on education equity globally. Check out the Equity Initiative’s June newsletter to get the latest updates and find out what's in the pipeline for the Equity Initiative's 3rd year. The Equity Initiative shares presentation slides, highlights, and resources from CIES 2018 in the April 2018 newsletter. 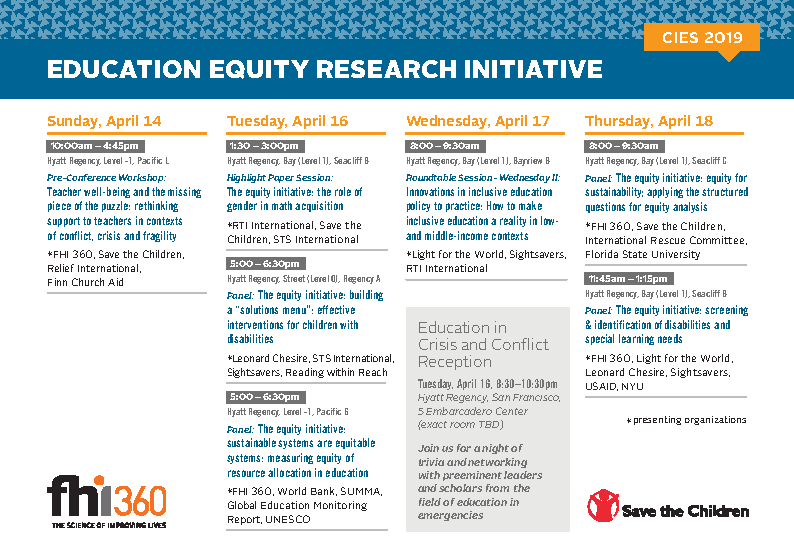 Learn about the Equity Initiative’s presence at CIES 2018 and how attend one of our panels and join our trivia night reception! Learn how the tools and resources developed by the Equity Initiative are being adapted and used in education programs on the ground! The Equity Initiative advances its research into new areas of inequality. Learn about the latest efforts to improve data and evidence on disability, gender, and accelerated education in the August 2017 newsletter! Delving Deeper into Inequality: Education Equity Research Initiative Newsletter! Read the May 2017 edition of the Education Equity Research Initiative quarterly newsletter to find out what the Initiative has in store for you this spring. The 2016 Global Education Monitoring (GEM) Report by UNESCO, shows the potential for education to propel progress towards all global goals outlined in the new 2030 Agenda for Sustainable Development (SDGs). It also shows that education needs a major transformation to fulfill that potential and meet the current challenges facing humanity and the planet. There is an urgent need for greater headway in education. On current trends, the world will achieve universal primary education in 2042, universal lower secondary education in 2059 and universal upper secondary education in 2084. This means the world would be half a century late for the 2030 SDG deadline. Check out highlights from the Equity Initiative panels at the 2017 CIES conference in Atlanta and other significant work from the Initiative's first year and learn about the different ways to take action moving forward. Education Equity Research Initiative at CIES! Check out a schedule of of panel sessions, workshop, round table discussion, and reception at CIES 2017!